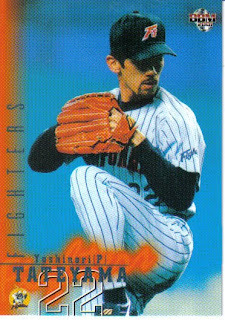 The Texas Rangers today signed pitcher Yoshinori Tateyama, formerly of the Hokkaido Nippon Ham Fighters. Tateyama's BBM rookie card is #432 from the 1999 set. 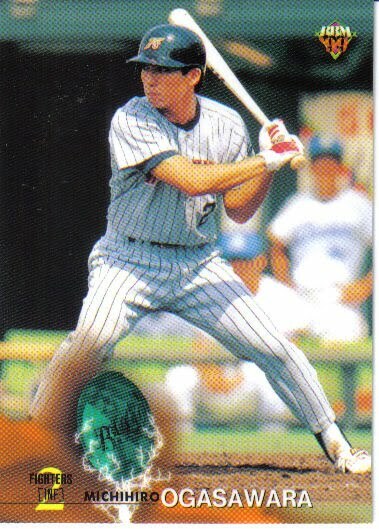 He's also card #10 in the Ovation Rising Stars serially numbered insert set from 2000, his only appearance in an Upper Deck set. As usual, I'm not 100% sure, but I don't think he's had any Calbee cards. He appears in many but not all of the BBM 1st and 2nd Version sets since 2002. 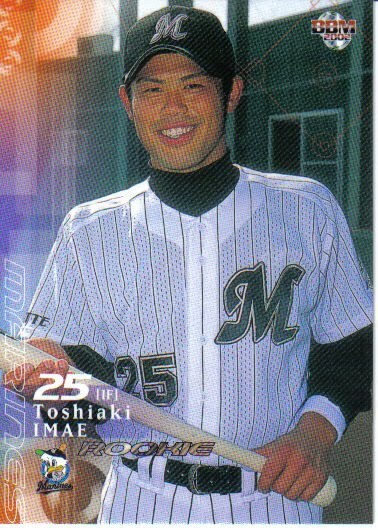 He only appeared in one All Star set (in 2000) and appears in three Nippon Series sets (2006, 2007 and 2009). As always, this is not meant to be a comprehensive list, merely some highlights. From top to bottom, 2001 BBM #195, 2000 BBM All Stars #A56, 2006 BBM Nippon Series #S06 and 2005 BBM 1st Version #521 (Leader subset). I thought it might be interesting to show an example card from each of BBM's regular sets from the last 20 years. This post will show 1991-2000 and I'll have another one (hopefully soon) showing 2001-2010. Deanna has more information on him here, along with some pictures. I have no idea how long the manga was published or even if it is still being published. Other than the comment on Japan Baseball Daily, I haven't found any information about it. 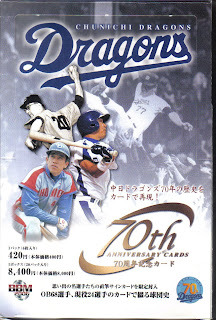 Five years ago, BBM put out a 70th Anniversary set for the Dragons. Like the Tigers last summer, they're not letting that stop them from putting out a 75th Anniversary set for the Dragons this fall. 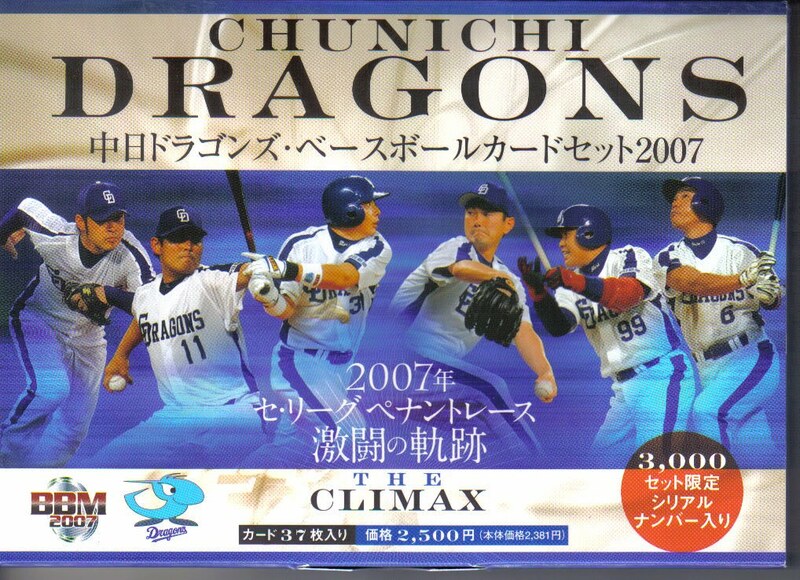 At least something significant happened for the Dragons in the last five years - winning their first Nippon Series title since 1954 in 2007. The set will be a pack-based set with the Anniversary set standard 99 cards, broken down into the Anniversary set standard subsets - six "History Of The Dragons" cards, 75 cards of OB players and 18 cards of current players. 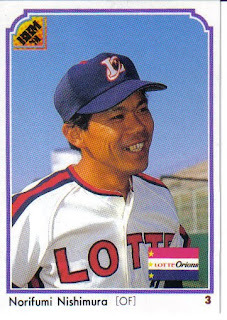 (Wonder if Ochiai gets two cards - one as OB player and one as current manager?) There's a OB Dragons Best 9 insert set (nine cards) and possible autograph cards. The set will be out in early December. This week BBM put information about this year's edition of their annual Nippon Series set up on their website. 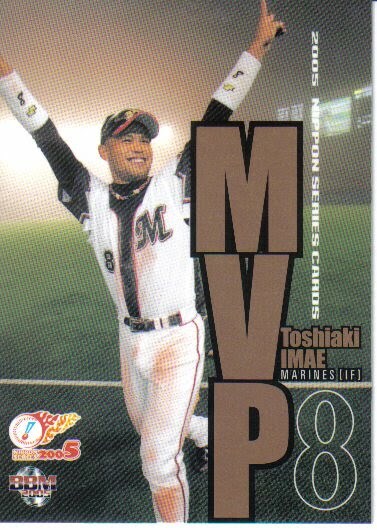 It's a box set containing 71 cards with 65 cards of all the players who appeared in the Series plus both managers along with cards for the Series MVP (Toshiaki Imae), the Fighting Spirit award winner (Kazuhiro Wada), and the Outstanding Player award winners (Tatsuya Uchi, Ikuhiro Kiyota, Yohei Oshima). The set is limited to 3000 and it will be released on December 6. And can someone explain why there was no first baseman named for the Central League? I'm going to wrap this up with a little less detail the some of the earlier posts. BBM has been producing a LOT of sets in the past few years, so I'm going to hit the highlights without getting all the nitty gritty about the sets. After a few years of experimenting in 2002-04, BBM pretty much stabilized the 1st and 2nd Version sets in 2005 as a large set (1st Version) and a smaller, supplemental set. That continued in the past five years. The 1st Version set typically ran 500+ cards with around 35 players per team plus the league leader cards. The 2nd Version sets would run roughly 250-300 cards with 12-15 players per team, plus update cards for the 1st Version set (for all years except 2008). Other sets that have been relatively constant for BBM over the past five years are the "Rookie Edition" (draft pick) and "Touch The Game" (high end) sets. All 12 teams have had a pack-based set usually running around 100 cards for each of the past five years also. The "Historic Edition" sets now always contain 144 cards - 72 OB players and 72 active players. The theme for the 2006 set was "Record Makers" - each card depicted a player that had set some record. The 2007 set's theme was "Draft Story" - each card featured a photo of the player from their rookie year (when they were drafted or signed as a couple players who weren't actually drafted were in the set). 2008 and 2009 were "Back To The 70's" and "Back To The 80's" respectively. Each set featured OB players from the decade in question and active players who were born in the decade. The 2010 set was called "Memory Makers" - each player featured had participated in some memorable event. In addition, BBM has continued to produce a box set for the All Star game and the Nippon Series as they have for every year since 1991. Starting in 2007, BBM started to produce another annual box set called "Rookie Premium" which was a high end set featuring rookie players from the season with a high likelihood of autograph or other memorabilia cards. 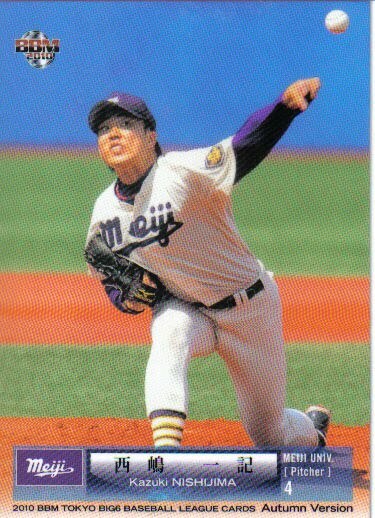 The addition of the playoffs in 2004 in the Pacific League and 2007 in the Central League has created a challenge for BBM. In the late 1990's BBM had started to produce a box set for each league champion every year. In 2004, they produced a box set for the Pacific League playoffs that featured all three teams. In 2005, they only produced box sets for two of the three PL playoff teams (Hawks and Marines, but not the Lions). 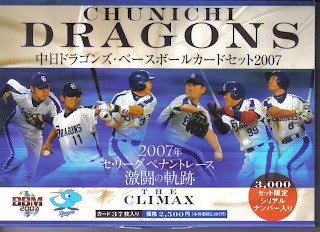 In 2006, BBM made box sets for all three PL playoff teams (Fighters, Hawks and Marines) as well as the CL Champ Dragons. In 2007, they did sets for all six playoff teams (Dragons, Giants, Tigers in CL, Fighters, Hawks, Marines in PL). At this point, I think they threw up their hands and decided it was too much. For 2008, I don't believe there were any sets created for the playoff teams. 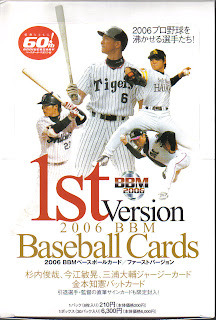 In 2009, BBM only did box sets for the teams that finished first in the league - the Giants and the Fighters. And again in 2010, it looks like no playoff sets were made. BBM has gone a little crazy over Anniversary sets over the last five years. 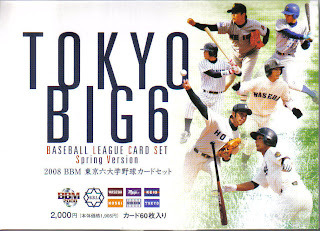 Before 2006, they had only done 70th Anniversary sets for the Giants (2004) and the Tigers (2005). In 2006, they did a 70th Anniversary set for the Dragons. 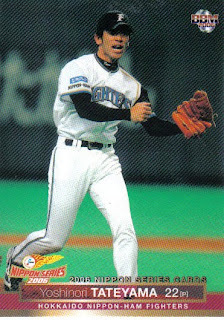 Starting in 2008, they really started pouring them on - sets for the Lions (30th Anniversary of their purchase by Seibu and the move from Fukuoka to Saitama), the Hawks (70th), the BayStars (30th of their move to Yokohama) and the Marines (40th of their purchase by Lotte). 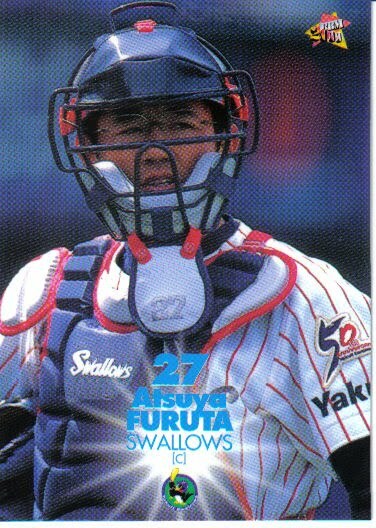 2009 saw sets for the Swallows (40th of their purchase by Yakult), Orix (20th of Orix buying the Braves from Hankyu), the Carp (60th) and Kintetsu (60th, even though they've been gone since 2004). All the teams except the Fighters and the Eagles had some sort of Anniversary set done. A couple of teams got revisited in 2010 with the Tigers 75th Anniversary and the Lions 60th Anniversary sets. In addition to the annual "Historic Edition" sets and the Anniversary sets, BBM has released a number of one-off nostalgic sets since 2006. 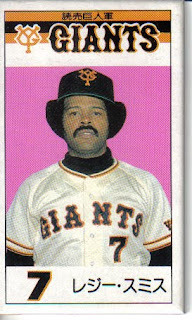 A prominent one released in 2006 was the appropriately titled "Nostalgic Baseball" set. It featured colorized pictures of players from the 1930's to the early 1960's. Other sets were 2007's "Home Run Chronicle" (top 45 lifetime home run hitters), 2008's "Lions Memorial" (companion set to the Lions 30th Anniversary set featuring players from the Lions' time in Fukuoka) and "Hiroshima Memorial" (commemorating the closing of the old ballpark in Hiroshima) and 2009's "Hankyu Braves Memorial" (a companion to the Orix 20th Anniversary set featuring players from the Braves before they were bought by Orix). In 2010, BBM issued a large set featuring both OB and active players to celebrate their 20th Anniverary. BBM continued to produce box sets for single players. 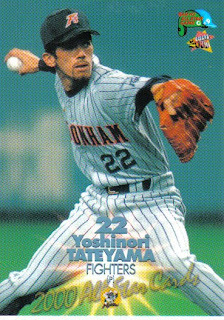 Usually they would release these sets in conjunction with the player (or manager) retiring or leaving Japan for the US, but a couple haven't had an obvious reason (at least to me). 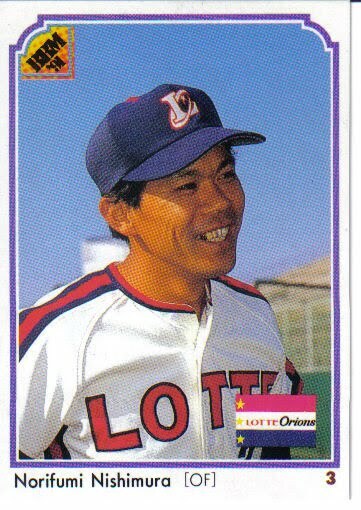 Since 2007, BBM has done sets for Masumi Kuwata (US-bound), Atsuya Furuta (retired), Tomohiro Kuroki (retired), Sadaharu Oh (retired), Kazuhiro Kiyohara (retired), Masaichi Kaneda (no idea), Norihiro Akahoshi (retired), Masahiro Tanaka (no idea), Kenta Maeda (no idea) and Hisashi Iwakuma (probably US-bound). BBM has released a couple box sets to commemorate a couple unusual baseball events. In 2008, they released a box set for the Japanese Olympic team. 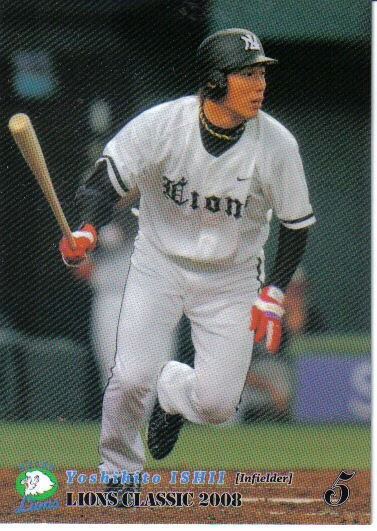 In 2008 and 2009, BBM released a small set called "Lions Classic" to coincide with a promotion done by the Lions where they would wear throw back uniforms for a couple series. The "Lions Classic" sets contain card showing the current Lions players in the throwback uniforms as well as an equal number of OB players wearing the original uniforms in question. And in 2009 and 2010, they produced a set for the "Premium Malts" old timer game played every year in the Tokyo Dome. Every year BBM seems to always end up producing a couple oddball little team box sets. 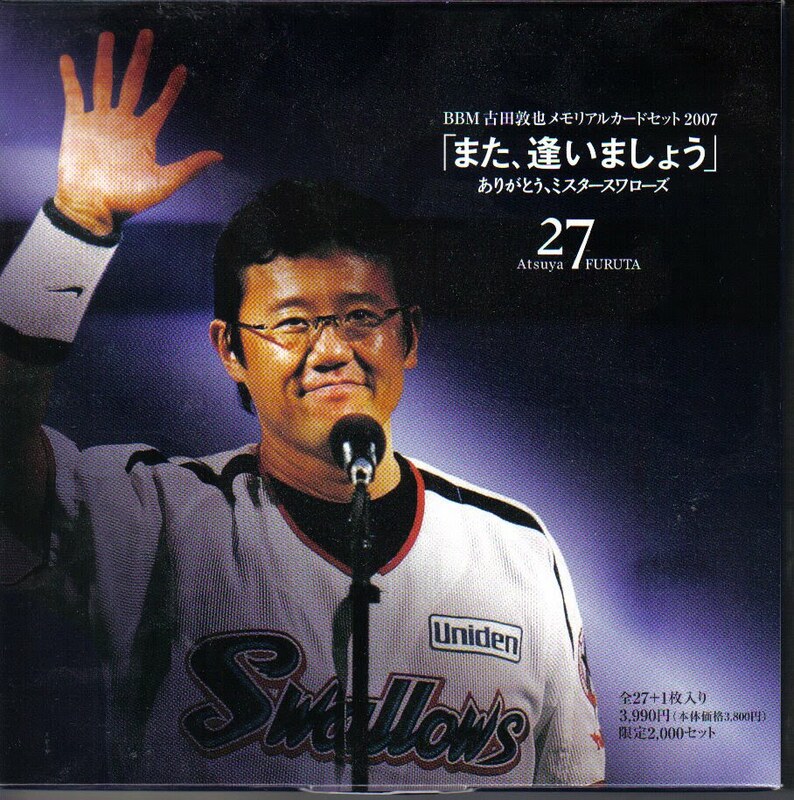 In 2006, they put out a set for the 2005 Nippon Series champion Marines called "Bobby Magic". In 2007, they did sets for the Lions ("Blue Leo"), the Carp ("Koibumi") and the Hawks ("Takanomi"). 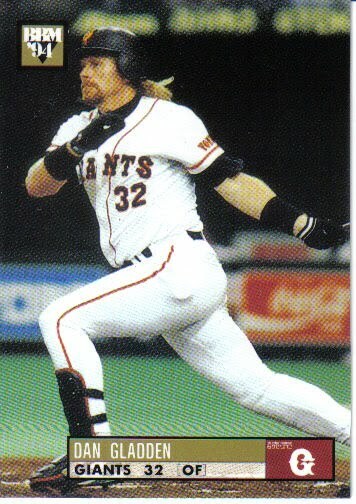 The Giants had sets in both 2009 ("Expression") and 2010 ("Real Beginning"). 2010 also saw sets for the Lions ("Young Lions") and Swallows ("Number 1s"). 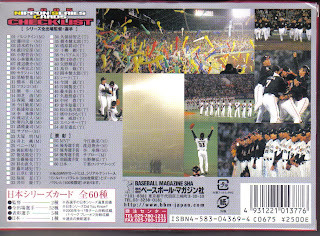 I got much of the information for the pre-2008 cards from Gary Engel's "Japanese Baseball Card Checklist And Price Guide". The remaining information I got from BBM's website via my own blog. 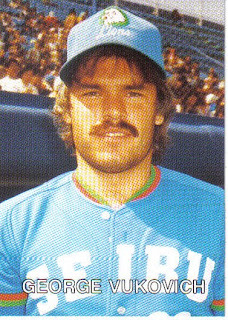 Following the 1988 season, Toronto Blue Jay first baseman Cecil Fielder was sold by the team to the Hanshin Tigers. 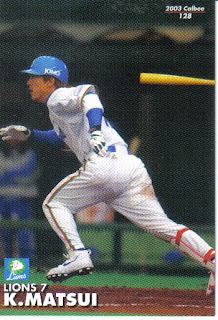 Fielder had been only a part time player for the Jays as he was blocked at first base by Fred McGriff. 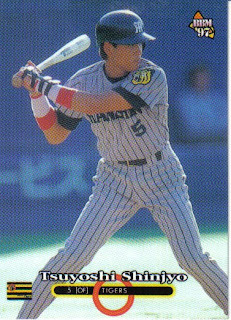 With a chance to play regularly for the first time with Hanshin, Fielder had a great season, hitting .302 with 38 home runs in 106 games. His season was cut short in September by a broken pinky. 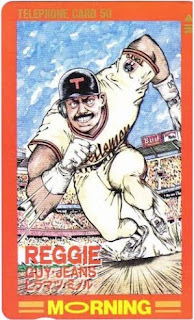 The following January, he signed a contract with the Detroit Tigers and proceeded to hit 51 home runs during the 1990 season, being the first batter to reach 50 home runs since George Foster in 1977. 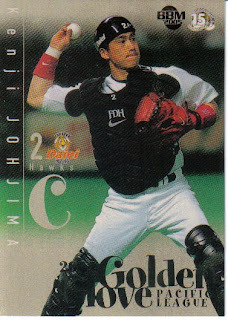 All of a sudden, Japanese cards of Fielder became a (relatively) hot item. 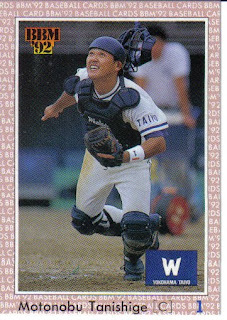 1989 was two years before BBM started doing cards, but Calbee and Takara were going strong. There are actually six cards of Fielder in the 1989 Calbee set and one of him in the Takara Tigers team set. 1989 was also the first of the two years that Lotte issued a 120 card set and Fielder is included in that set also (his name is actually misspelled "Fieldar" on the card). 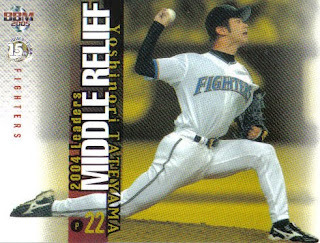 And that's pretty much it for licensed Japanese cards of Fielder. Or is it? 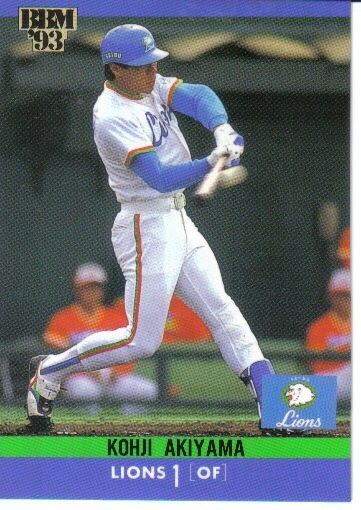 Gary Engel's "Japanese Baseball Card Checklist and Price Guide" has this sentence at the end of the description of the 1990 Lotte set: "It is claimed that a few Cecil Fielder #117 cards were printed, but they are not part of the regular set, as they must have been withdrawn very quickly." To be completely honest, I was highly doubtful that such a card actually existed. 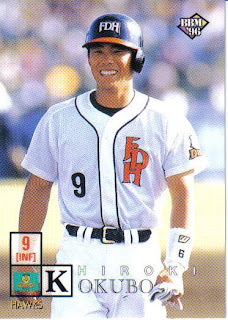 While it happened some with the bromide and menko cards in the 1950's and 60's, it would be highly unusual for a card company to issue a set in 1990 featuring a card of a player who played in Japan in 1989 but not in 1990. Unlike US cards where the current year's cards frequently show players on their team from the previous year, Japanese cards tend to be a lot more up to date. So I really didn't think this card was real. Then I got a comment from someone to this post claiming that they had found the card in a box of old cards. 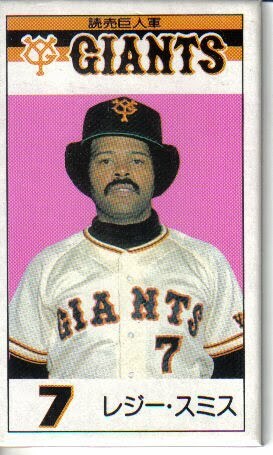 I was still skeptical - the commenter said that the card was #117 and his name was misspelled Fieldar on the back. 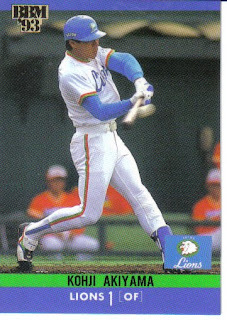 I pointed out that his 1989 card was also #117 and was known to have a misspelled name, so they most likely had the 1989 card, but I took the person up on her offer to send me a scan of the card. If it's a fake, it's a really good one. 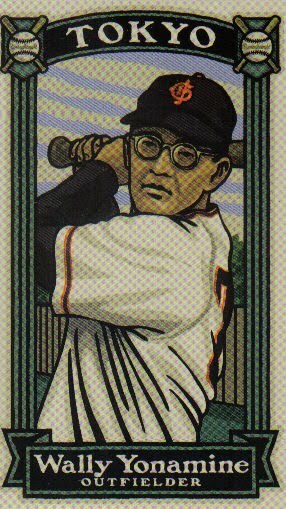 The year of his birth is listed as a Showa era year (38 as opposed to 1963), just like all the other Lotte cards. 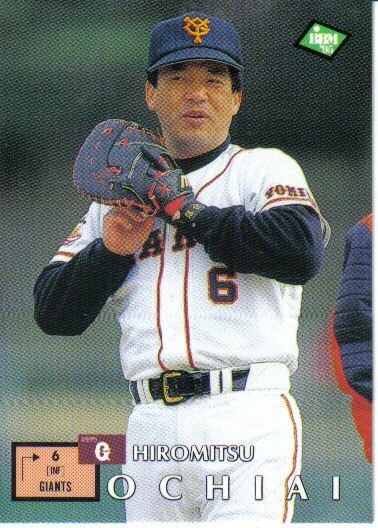 I'm not sure why his middle name is listed, but I have a 1989 Lotte card of Willie Upshaw that also lists him with his middle name, so it may just be something Lotte did for some gaijin players (although not all). I can't read the text, so I don't know if it makes any sense, but again, if it's a fake, it was done by someone who really knew what they were doing. And really, if you had counterfeiting skills that good, wouldn't you be concentrating on something a little less obscure? So I'm inclined to think it's real, although the person who sent me the scan was going to send it to Rob Fitts also, so I'll be real interested in what Rob has to say. 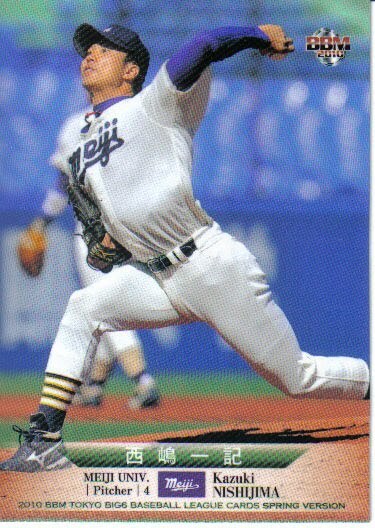 One last thing that I picked up in reviewing some of Fielder's online information - he had actually signed a two year deal with Hanshin prior to the 1989 season that included a clause allowing him to get out of the contract if he got offered a major league deal. He didn't sign with Detroit until mid-January of 1990, so maybe Lotte was working on the set with the assumption that he was going to play for Hanshin in 1990 (since he was under contract), then had to hurriedly pull the card when he returned to the States. Sources for this post include Baseball-Reference's stats and bullpen pages for him as well as his write up on Japan Baseball Daily. - a 28 card box set for Hisashi Iwakuma featuring 27 "regular" cards and one possible memorabilia card (Eagles jersey, Kintetsu jersey, undershirt, autograph, parallel edition of "regular" card). There's no release date for the set listed (so far). - a 28 card box set for Kenta Maeda featuring 27 "regular" cards and one possible memorabilia card (jersey, patch, bat, undershirt, autograph, parallel edition of "regular" card). There's no release date for this set listed either. - a 28 card box set (I think I see a trend here) celebrating the players who have worn uniform number 1 for the Swallows (at least since they've been owned by Yakult). 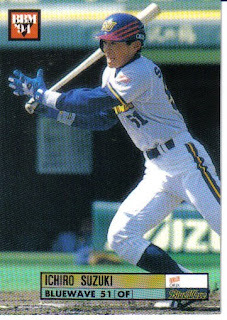 The set has 27 "regular" cards - 18 for Norichika Aoki and three each for Tsutomu Wakamatsu, Takehiro Ikeyama and Akinori Iwamura. The remaing card is possibly a parallel edition of one of the regular cards or some sort of memorabilia card - jersey, bat or autograph for Aoki or an autograph from Wakamatsu. The set will be out in late November. The Chiba Lotte Marines wrapped up their improbable drive to the Nippon Series championship today by beating the Dragons 8-7 in 12 innings. It was improbable in that not only are they the first third place team to win the championship, but they only barely squeaked into third (and the playoffs) the last week or so of the regular season. And so much for the Central League's plan to schedule their Final Stage of the playoffs closer to the start of the Nippon Series to keep their champion sharp. Doesn't look like the two weeks the Marines had off before the Series started caused them any problems. 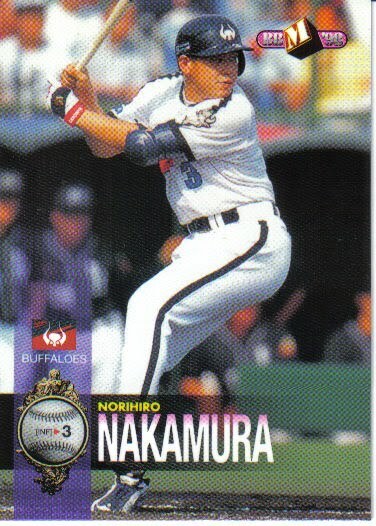 Jason asked an interesting question in a comment to this post the other day: what players have won championships in both MLB and NPB? 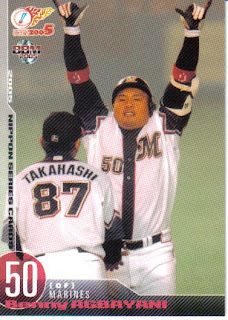 We came up with a couple names off the top of our heads, but I spent some time with both Baseball-Reference and Japan Baseball Daily and I think I've come up with the complete list. 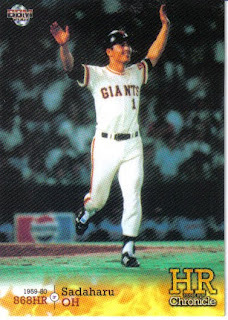 First, here's my criteria: the player had to actual appear in the World Series or Nippon Series to actually count. It's not good enough to simply play for the team during the season they won the championship, or even appear on the post season roster, but not appear in a game. Iguchi may shortly have a second NBP champion to add to his list. Taguchi was on the Phillies World Series roster in 2008, but did not play. The players eliminated because they played for a team that won a championship but didn't play in the World Series were Adrian Garrett (14 games for the 1972 A's won championship with 1979 Carp), Doug Jennings (4 games for 1989 A's, NPB champ with 1996 Blue Wave) and Domingo Martinez (15 games between 1992 & 1993 for Blue Jays, NPB Champ with 2000 Giants). The one guy I'm on the fence on including is George Vukovich, who was on the Phillies 1980 World Series roster but did not play. 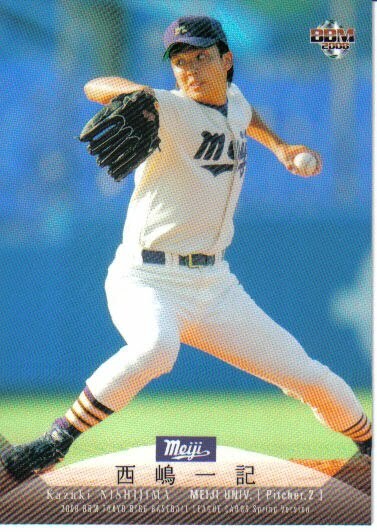 He won NPB championships with the Lions in 1986 and 1987. That's Dan Gladden's card from the 1994 BBM Nippon Series set (#S26) at the top of the post and George Vukovich's card from the 1987 Play Ball set (#34) at the bottom. Tomorrow night, the Marines will play their first home game of the post season and the Dragons will play their first road game as the Nippon Series resumes with Game 3 in Chiba. I wanted to take a second to remind everyone what happened last time the Series was played in Chiba in 2005. For those who don't know, Chiba Marine Stadium is located right next to Tokyo Bay. After six innings in Game 1, the Marines were leading 5-1 over the Hanshin Tigers. Then the fog rolled in off the bay. The Marines scored 5 runs in the bottom of the seventh, including home runs from both Benny Agbayani and Tomoya Satozaki. I may not be remembering this correctly anymore, but I think that the outfielders were having difficulty locating the balls hit into the fog. The umpires ended up calling the game after seven innings (not sure if they actually played the entire bottom of the seventh or not), so the Marines ended up with a 10-1 victory. They scored 10 runs again in Games 2 and 3, then squeaked out a 3-2 win in Game 4 for the sweep. The weather forecast for Chiba this week does not include fog, so there shouldn't be a repeat this year.